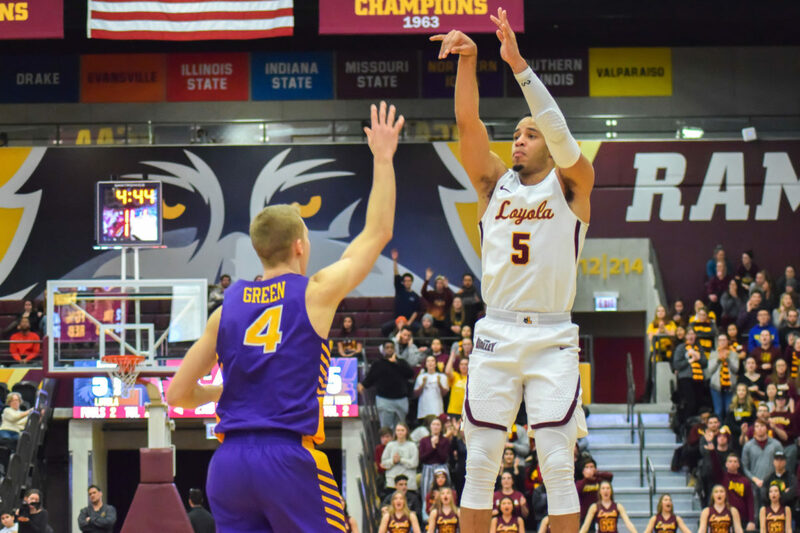 Tim Edmonds | The Phoenix Sophomore center Cameron Krutwig had 22 points and 11 rebounds for his fourth double-double of the season against UNI Jan. 30. 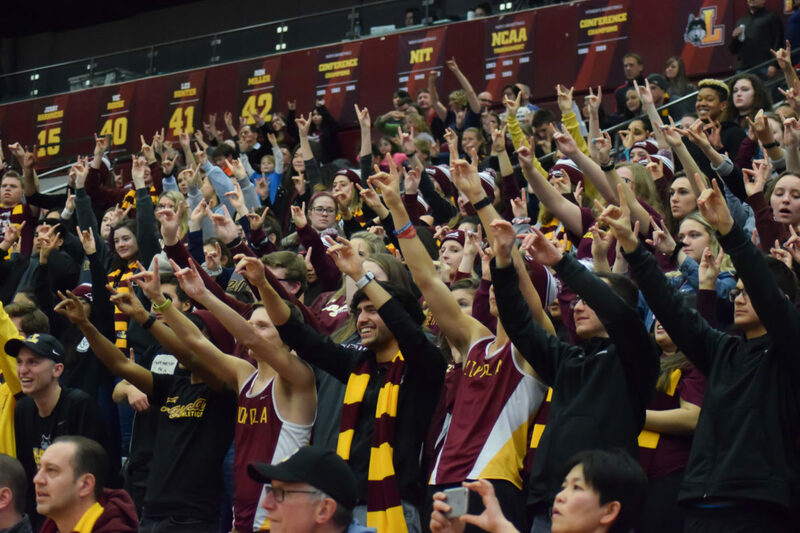 Tim Edmonds | The Phoenix The Loyola student section cheers on the men's basketball team against UNI Jan. 30. Tim Edmonds | The Phoenix The Loyola men's basketball team prepares to huddle up after a play. Tim Edmonds | The Phoenix Loyola redshirt senior guard Marques Townes prepares to shoot a free throw. Tim Edmonds | The Phoenix The Loyola student section "raises the 'Bler" during a free throw. 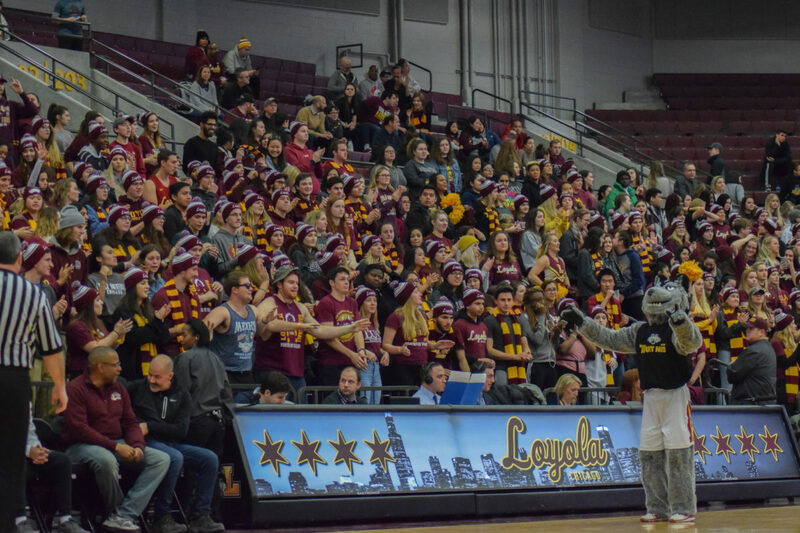 The same day record-breaking cold temperatures hit the Chicago area, Loyola sophomore center Cameron Krutwig sank his first career three-pointer to give the Loyola men’s basketball team (14-8, 7-2) a 61-60 win over University of Northern Iowa (UNI) — and send the Gentile Arena faithful home feeling a bit warmer. He said the last three-pointer he’d made was in his senior year of high school and, like his first collegiate three, was also a corner shot. Tim Edmonds | The Phoenix The Loyola student section reacts to Cameron Krutwig’s three-pointer against UNI Jan. 30. “I’m a corner specialist,” Krutwig joked. 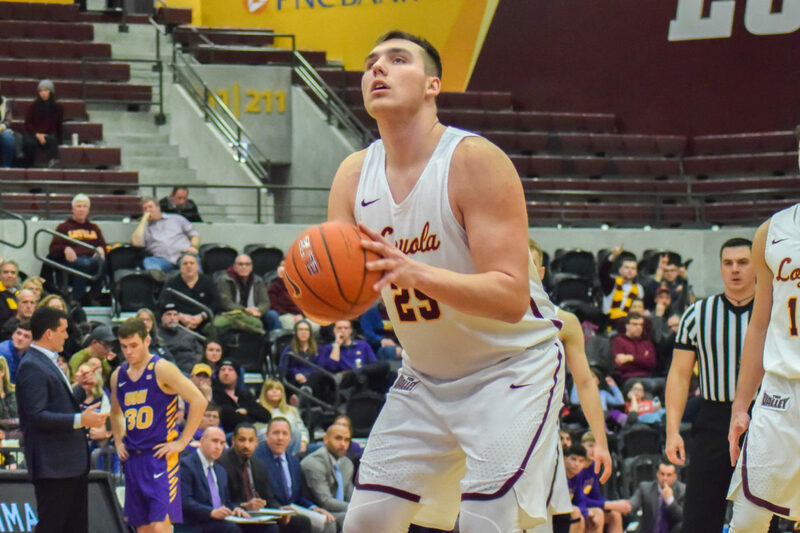 Krutwig led the Ramblers with 22 points and 11 rebounds for his fourth double-double of the season. Redshirt senior guard Marques Townes added 19 points and junior guard Bruno Skokna poured in 11. Before the game, it was announced sophomore guard Lucas Williamson had hand surgery as a result of re-injuring his broken hand against Indiana State University Jan. 19. Loyola head coach Porter Moser said he was doing well after surgery and would be back in three weeks at the earliest, but most likely would be back in four weeks. Coming into the game, the Panthers were sitting in sixth place in the Missouri Valley Conference (MVC). With this loss, they fall to 9-13 overall and 4-5 in MVC play. Junior forward Luke McDonnell and first-year guard AJ Green both had big games, tallying 16 and 14 points, respectively. The total attendance for the game came out to 3,011 — highlighted by a loud and outgoing student section. Despite not having class due to the -30°F wind chills, the student section was packed and Moser credited the students for the win. 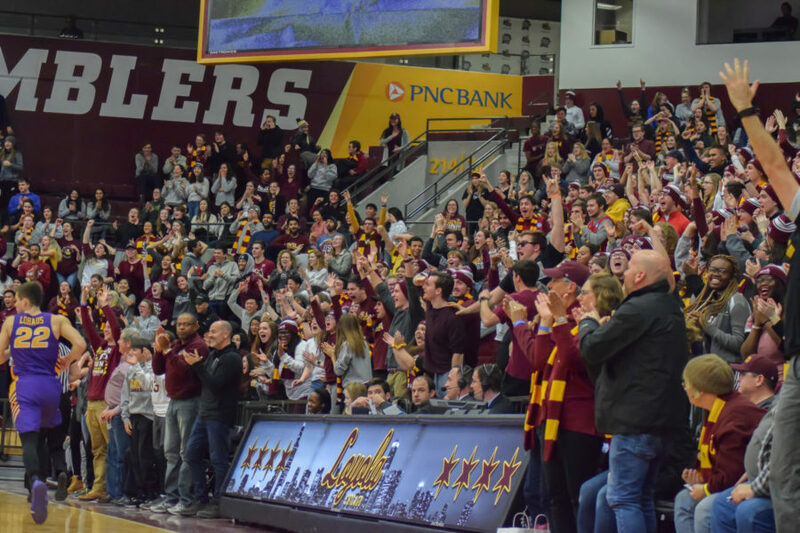 After the game concluded, Moser grabbed the microphone to address the student section and thank them for coming out in what he described as a spur-of-the-moment decision. 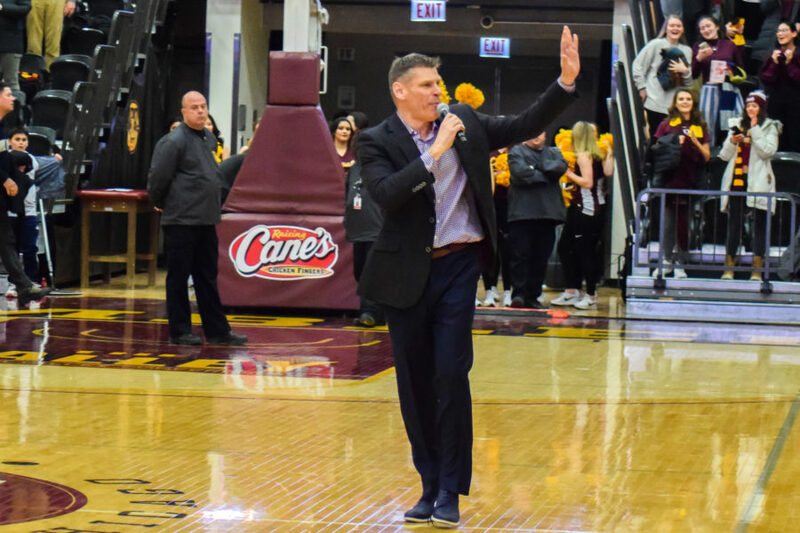 Tim Edmonds | The Phoenix Loyola men’s basketball head coach Porter Moser addresses the Loyola student section after the Ramblers’ victory over UNI Jan. 30. 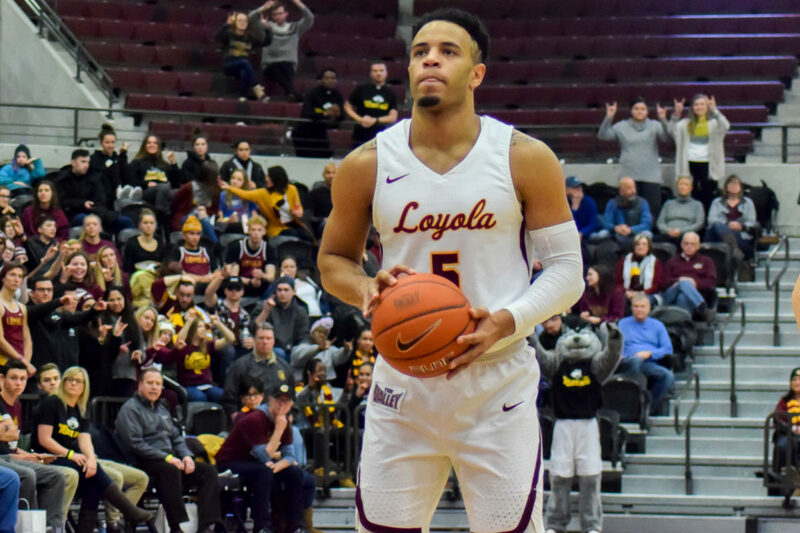 The Ramblers struggled from outside in the first half, starting 3-for-9 from the three-point line, but went 7-for-12 from inside to keep the game close. Eight turnovers and hot three-point shooting from UNI caused the Ramblers to trail 33-26 at halftime. UNI continued to lead for most of the second half until back-to-back shots from Krutwig and Skokna caused the first of seven lead changes to happen in the second half. 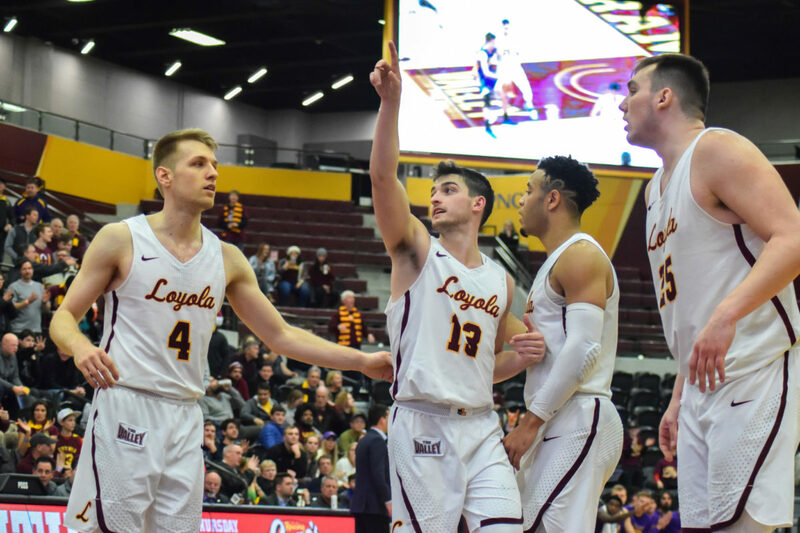 Krutwig continued to dominate in the last five minutes of the game, scoring Loyola’s last six points — including the big three-pointer to ice the victory. 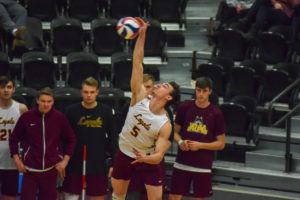 The game was also the 20th annual “Jesuit Jam,” a night spent celebrating Loyola’s Jesuit mission while also supporting the Ramblers’ athletics events and important causes within the Rogers Park community. Proceeds from the game were going to help Centro Romero, an organization in Rogers Park that has provided help to immigrants and refugees for 30 years. The Ramblers are next scheduled to travel to Illinois State University for a 9 p.m. tilt against the Redbirds Feb. 2. The game will be broadcasted on ESPN2.